An honest attempt to illustrate the disposition and struggles of an array of bodies, minds and spirits within a community mobilizing and working together utilizing music, voice and movement. Alexandra Marzella is a multidisciplinary artist, actor and activist working and living in New York City primarily focusing on performance art. Claire is an interdisciplinary artist, working in video (often performative), photo, illustration and sculpture. 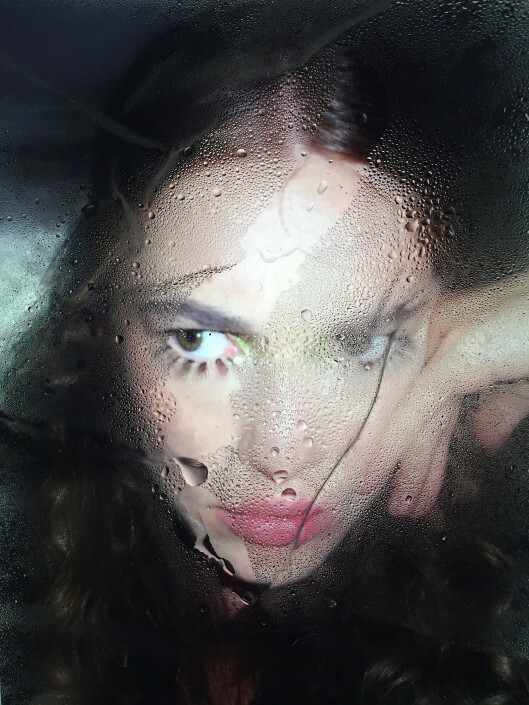 She graduated from the School of Visual Arts in 2015, receiving a BFA in Photography. Claire lives and works in New York City. Daniela is a multi- media artist and costume designer who warps the medium of fashion with experimental audio and video. She graduated from the Rhode Island School of Design in 2014 with a BFA in Apparel Design. Ysanne composes immersive scores for sensory experiences. She was born in London in 1972, studied composition and conducting at the Royal College of Music, and has a dual career as a composer, and as an author. She brings ideas gleaned from throughout both of her careers into one time and place, wherever she creates, bringing together her expert skills and personal insights cross-modally, to engage all five senses, with technology. The ideas she is presenting for her performance at National Sawdust are a step towards her current project, a large-scale experiential sensory experience called YNTEGRITY that will be presented in 2017. Jerome AB is a Kenyan-born designer and performance artist based in Brooklyn, NY. Jerome’s work incorporates various creative disciplines, most predominately: architectural theory, design and analysis, interior design, photography, videography, graphic design, dance and movement. 25 yr old Korean female. Jane of all trades. Helper of all. A poet. A force. Currently based in Chicago. A teacher! Musician/Actor/Wig Lady from Kingston, Jamaica. Olimpia Dior is a performance artist photographer and filmmaker as well as psychic consultant and disciplinarian. Patric Dicaprio is a designer. Patric Dicaprio is into fashion. Patric Dicaprio is into short and sweet. Jasper Briggs, born 1995 in Brooklyn, NY, is a documentary photographer, whose images reflect the human condition. Native NY, multi media artist and videographer. Richard Kennedy is a Brooklyn, NY based performance artist. After attending Point Park University on a theatre/dance scholarship, Richard moved to New York to appear in Wicked, West Side Story, & Fosse. Richard has choreographed for SSION, Breedlove, Hercules & Love Affair, and Animal Feelings. As a singer-songwriter, Richard has recorded “You can Shine” with Andy Butler and “For Some Reason” with Nick Monaco. Richard will release his debut EP “Open Wound in a Pool of Sharks” on Sweat Equity Records this Spring. Richard will begin study for his MFA in Music & Sound at Bard College (19) this summer and continues to develop his body of solo dance/ performance work and the opera “Black Rage” which premiered at Signal Gallery February 2016. I am a performer and every second of my life I am performing. India Salvor Menuez is a multimedia/performance artist and organizer. Based in her hometown of New York, she spends most of her time in her Chinatown home/studio. Chibi Cherry is a character Menuez created in January 2015 to start sharing her movement work; an inter-dimensional cutie lacking direction and lingering in that. The Chibi Cherry project has continued to grow into a broader spectrum of performance work dealing primarily with representations of power and insecurity. Lee is a young artist existing and experiencing in NYC. A butterflies’ wing, a drop of golden sun. Ritual meditations on digitalized existentialism. Compile present audio-visual narratives wrought from modern technocracy’s synthetic residue. August 22, 2016 - 10:00pm An honest attempt to illustrate the disposition and struggles of an array of bodies, minds and spirits within a community mobilizing and working together utilizing music, voice and movement. August 24, 2016 - 10:00pm Kelly Zutrau, the lead singer and songwriter of Wet will perform songs from their debut album, alongside new unreleased songs in her most stripped down performance to date. 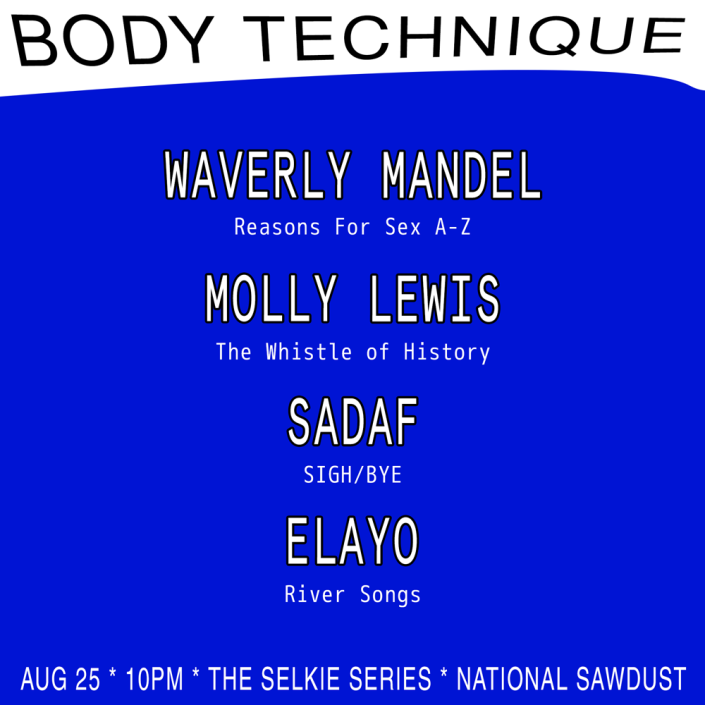 August 25, 2016 - 10:00pm Waverly Mandel will present BODY TECHNIQUE: an evening of music and performance that elaborates on the theme of communication and its relationship to the body. 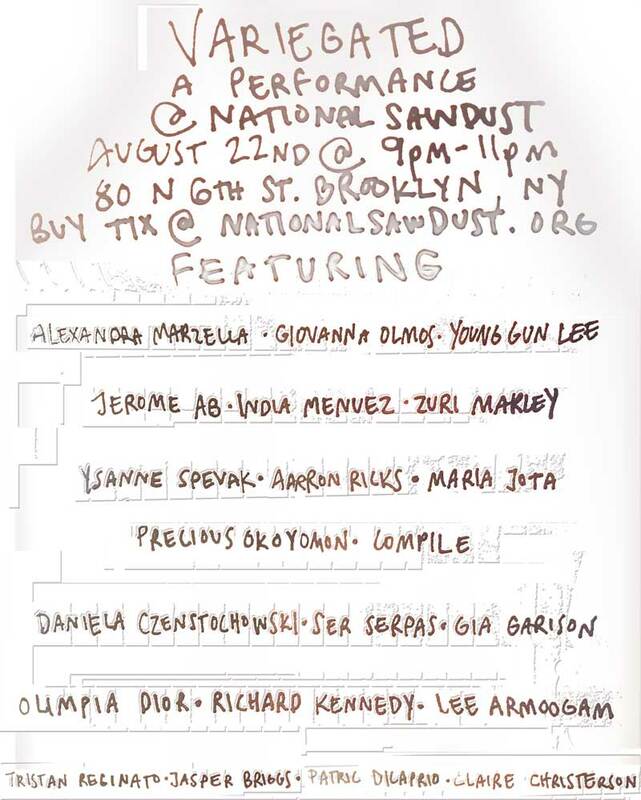 The evening also features performances by SADAF, Molly Lewis, and Elayo. August, 31, 2016 - 10:00pm Kimbra presents a unique setup featuring live looping, sampling and musicians Spencer Zahn and Timon Martin to recreate songs from her albums, 'Vows' and 'The Golden Echo' as well as new and unreleased material. This performance will also showcase visuals by Phillip Stearns through a realtime interplay of color, optical patterns, and dynamic lighting of surreal 3D generated landscapes. August 11, 2016 - 10:00pm The collective focuses on nurturing the collaborative space for passionate female creative professionals. We release film music art showcase curate events and exhibitions. 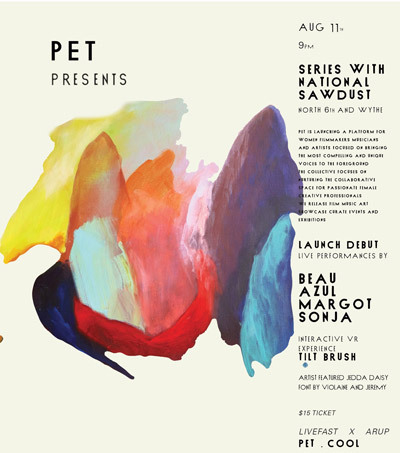 For their inaugural launch, the first of a six series showcase, features live performance by BEAU, AZUL, MAROT and SONJA, and interactive VR experience with Tilt Brush.